Passages provides a responsive mentoring environment where youth in foster care direct their own learning adventures through participation in experiential workshops designed to develop self-knowledge, creativity, and responsibility. The Passages program is overseen by Holly Paar, Program Manager. Camp is directed by Christopher Keiser. Four times a year, youth attend camp where they build consistent relationships with other youth in foster care and Under One Sky staff. Youth participate in life-skills workshops of their choice, ranging from writing a resume to applying for college and financial aid. Youth also attend small council groups where they share in activities and discussions with peers and staff. Other activities include talking circles, Workplace Day, community service projects, and youth-led non-denominational Sunday services. Camp projects often lead to even greater achievements by the youth in our program. The song “You Never Know Who I Can Become” began as a youth writing project during Summer Camp 2006 and was recorded in 2007 by seven youth at Whitewater Recording Studio in Asheville. Under One Sky invites guest instructors from the community to lead workshops and performances. Recent guests included members of the Asheville Lyric Opera, writing and performance instructors from Winston-Salem Youth Arts Institute, local hip-hop artists Cactus and Mahira, SAYSO (Strong Able Youth Speaking Out), and Charles Blount, author of Charlie Boy. Passages is held in the mountains of Western North Carolina, where campers can enjoy the outdoors through fishing, hiking, swimming, rafting, and more. The 16-18 seasonal camp staff for Passages commit to at least two years of providing consistent mentoring relationships with the youth in our program. Six full-time and two part-time year-round staff also participate in camp sessions. Cabin counselors and instructor-mentors provide a strong camper-to-staff ratio of at least 4:1, with total camper-to-staff ratios during the day averaging 2:1. Social workers, foster parents, one-on-one community workers, and adoptive parents are welcome to spend a day with us as well. 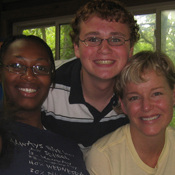 Family Camp is a day program offered to the families of youth enrolled in Passages. Families involved in any phase of the adoption process and families providing guardianship are encouraged to attend. Siblings and anyone living in the home are also invited to participate. Are you a youth interested in our camp? Please download our Youth Brochure. If you are a foster or adoptive parent, foster care/adoption worker or other professional, please download our Brochure for Guardians and Professionals. You may also download our 22-page Program Guide that explains our enrollment process and more. For more information about the camp programs, contact Holly Paar, Program Manager.